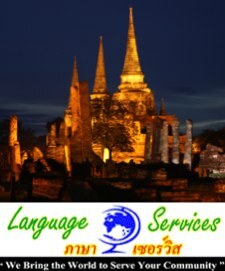 Language Services (LS), based in Ayutthaya- the World Heritage City, is looking for native English speaking candidates to fill up teaching positions in different locations in Thailand. School Locations: Ayutthaya, Mukdahan, Narathiwas, Chayaphum, Angthong, Nakhonsawan, Sukhothai, Loei, Chiangrai etc. - Starting date: May 16, 2017 Contract length: 6 months to 1 year contract (with possibility of extension, depending upon your performance). *****Remarks: All of the selected candidates who are new to Thailand, after the interview via Skype or walk-in for the full-time teaching positions starting May 16, 2017, are required to attend a 3-day teacher training and orientation on May 6-8, 2017 at Woraburi Ayothaya Convention Resort in Ayutthaya. http://www.woraburi.com/woraburiayothaya/index.html This program will help our new teachers to get familiarized with Thai schools and environment before they start the full-time positions. Classroom activities, practical teaching, Thai language for communication and Thai culture introduction (Ayutthaya Floating Market, ancient ruins, Thai massage, Elephant Camp) will be included in the orientation program. The Certificate of Attendance will be awarded to every candidate. Contracts will be signed and school names will be informed during the teacher training workshop. Intended for final year university students to earn credits for study by volunteering to teach at a school in our network across Thailand. The program covers 3-12 months. A selected volunteer will be attached to a school. The school will provide meals, accommodation as well as cultural and teaching experiences. The fees to join the program will depend on the length of attachment.